yesterday, i was working with someone else on organizing his family photographs and i was slightly jealous, seeing the sheer number of photos this family had taken and posed for on their myriad travels around the world. i’m not completely sure why i was jealous, because it isn’t as though i come from a family of stay-at-home, unadventurous and untraveled people. i suppose it had something to do with their somewhat meticulous arrangement, organization and labeling. it had to do with how well-preserved those kodacolor images of fashionably dressed americans in front of the trevi fountain were. it had to do, too, with my own lust for travel and my jealousy for where these very very well-traveled people had been. but then i come home, look at my own collection of familial memories and don’t feel quite so jealous. they may not have been kept organized in albums and labeled with dates, but that doesn’t matter. the fact that they are my people on their long ago (or relatively recent) travels is what makes the difference. 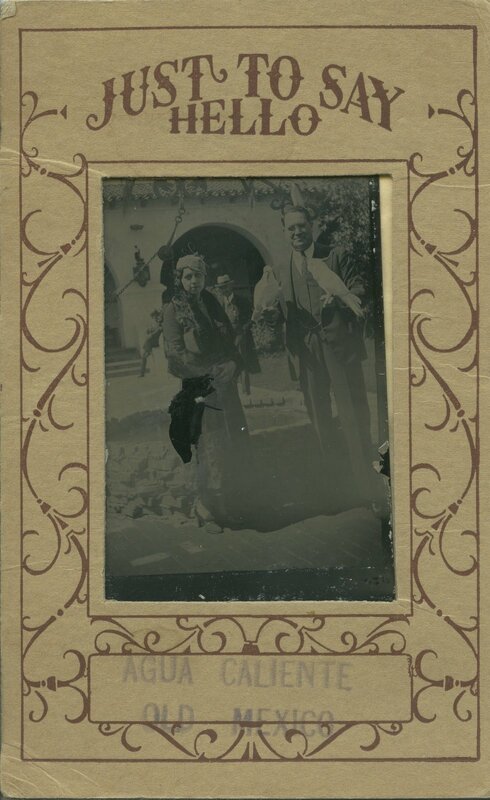 rona brown rose richman (1906-1992) and charles harold rose (1894-1964) in agua caliente, mexico.